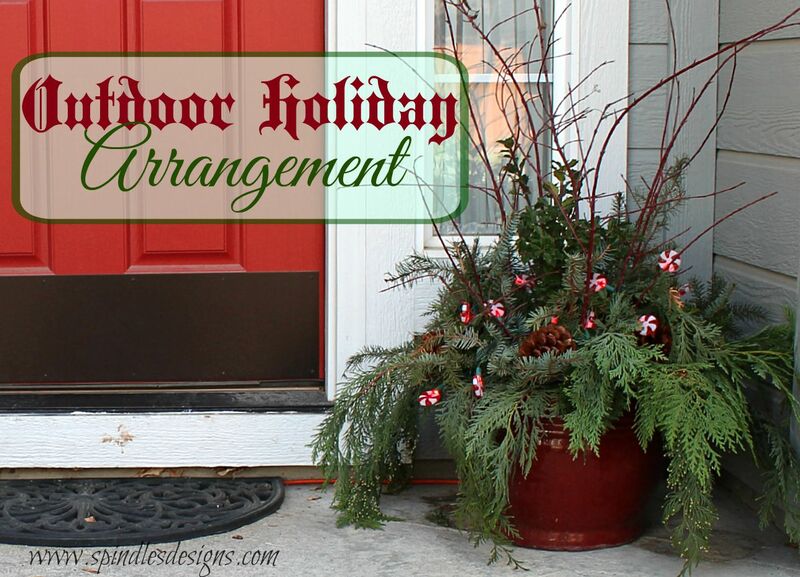 Last December we went to a outdoor holiday market and saw these wonderful outdoor arrangements made from all sorts of greenery. As we continued to walk the market, John said, ” we could make one from all the trees and scrubs we have in our yard and it wouldn’t cost hardly anything.” When we got home we decided what to use and got started. When I was growing up my mother made a recipe called “Crumb Pudding” and I always thought it was the same as “Bread Pudding”. I was way wrong! Totally different. Don’t get me wrong Crumb Pudding is wonderful and I will have to post it another time. I wanted to make Bread Pudding and see what it was like. John and I had an idea of what we wanted it to taste like, so off to the internet. 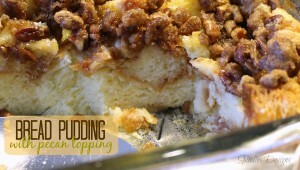 Bread Pudding with Pecan Topping is what we came up with after reading many recipes and not liking any of them 100%. 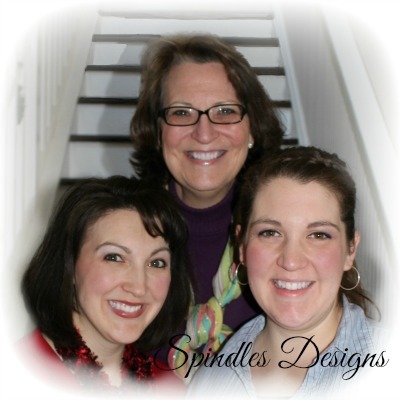 Welcome to Spindles Designs! Please be patient with us while we are under construction. Happy, Happy 1st Birthday to the The Love Nerds! One year ago today, I published my first ever blog tutorial for the Letter Wall in my office. I was terrified. Nervous. And also excited! I never guessed then how much would change in year. How far The Love Nerds would come as a blog and Etsy shop! Plus, I worked my first wedding and first party as an event coordinator. I initially started writing as way to focus on positive things in my life – like crafting and cooking – while my health and job were a challenge. The Love Nerds was really a distraction at first. Who knew this little corner of the internet called The Love Nerds would become such a huge part of my life?! The people I have met online in the past year have been such an amazing source of inspiration and support for me, and I am eternally thankful to all of you! I have really enjoyed sharing my experiences with you, and I hope you will continue to stick around! 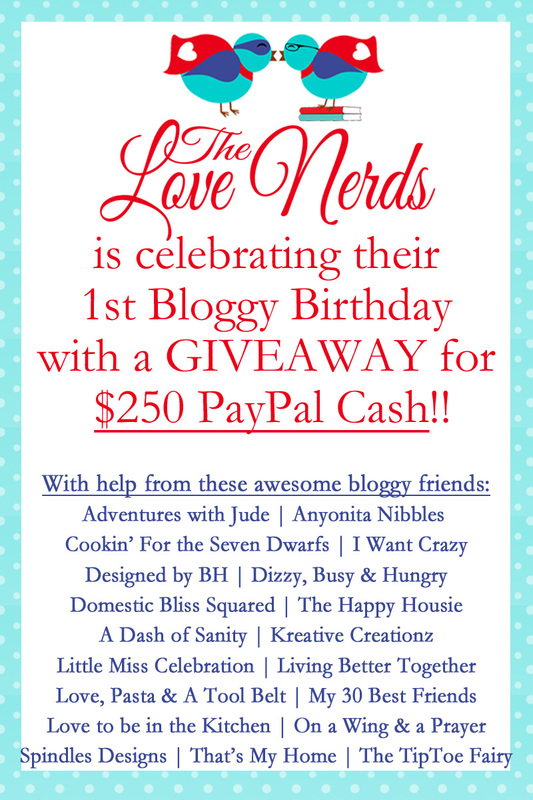 To thank all of you and to celebrate The Love Nerds 1st Bloggy Birthday, I and 19 of my amazing Blogging Friends are hosting a $250 PayPal Cash Giveaway!! How awesome is that?! Everyone could use a little extra money, whether it is to help with bills or just to treat yourself! These ladies are so incredibly talented, and I am thankful they came on board for this! I want to take a moment to introduce them to you before we get to the giveaway. 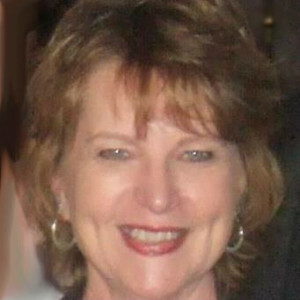 Meg is a city girl from Philadelphia transplanted to a 19-acre farm in the Garden State of New Jersey. She started college wanting to be a pediatrician, but ultimately graduated with a BA in theater, a minor in English, and her best friend and husband, Neal. They have five children, all with special needs. She homeschools three of them between the pick up and drop off for two others, and blogs about their adventures at Adventures with Jude. As a mother of five, daycare provider, and head chef/owner of Delectable Moments, a catering business I started four years ago, I’ve discovered ways to make life easier while maintaining great taste. And on occasion, I find solace in the adventure of a challenging recipe or the elevation of an experience with heartfelt touches and a bit of panache. Hi! 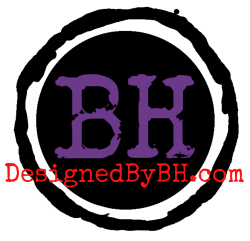 My name is Brooke, and I blog over at DesignedByBH. 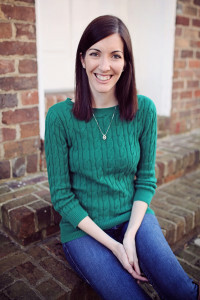 I’m a married 30-something living and working in the ATL while blogging about Crafts/DIY, Recipes/Food, all things Wedding, & our occasional adventures as new homeowners. A few years ago, my husband & I had a very “hands-on” wedding & when it was over there was a huge void in my previously very busy life! I’ve always loved to cook & craft & I loved working on my wedding so much that I decided to throw it all together in a blog! I’ve fallen in love with blogging & social media & can’t wait to share a little bit of my love with you! Hi, I’m Kristin from Dizzy Busy and Hungry, and I am a really busy working wife and mom of two teenage boys. My life feels like such a whirlwind, it makes me dizzy sometimes! But even though things seem to be moving a mile a minute, I still strive to prepare healthy, delicious food. My blog is all about kid-friendly, nutritious weeknight meals for busy families, and I also throw in some side dishes, desserts, and even cocktails for the adults from time to time! Hi! We’re Hilary and Jessica, & we’re the two sister-in-laws who together run the diy/lifestyle blog Domestic Bliss Squared! We’ve known each other for over 10 years, since Hilary started dating Jessica’s husband’s younger brother. It wasn’t until the birth of our daughters (9 weeks apart!) though that we became best friends. After 4 years we decided that we needed an outlet for our mutual love of crafts, cooking, sewing, & fashion, & our bloggy baby was born. In January of 2013 a dream came true for both of us! 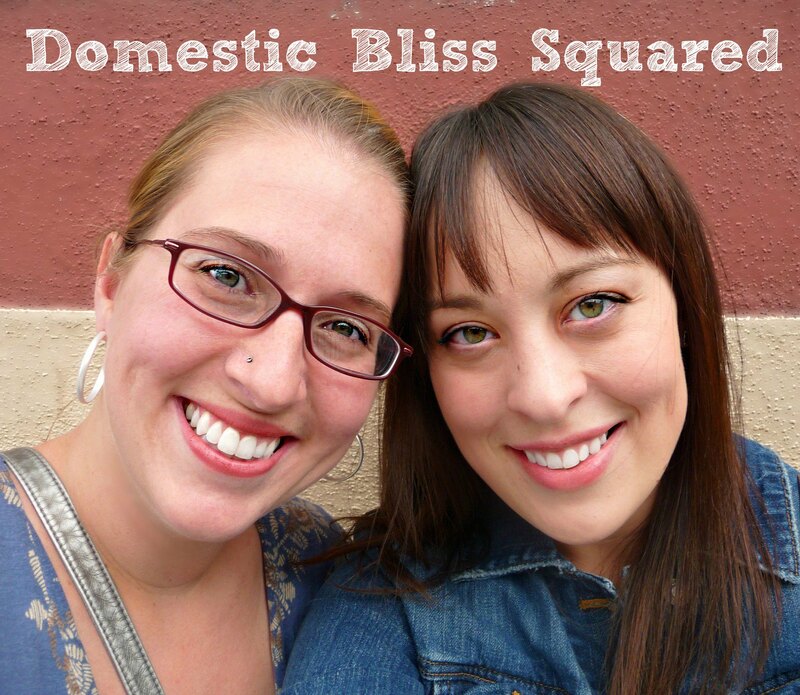 Jessica’s family relocated to Boise, ID, where Hilary was living with her family! Now we live a mile apart after years of long distance friendship & we run our blog together in person from our living rooms & local coffee shop! The Happy Housie is a blog about all things housie (DIY, decorating, crafts, organizing, and making old things new). As an adult I realize that there is no such thing as a “dream” home and that every home we have lived in (four in twelve years) becomes our “dream” home when we add our own imprint upon it. HOME isn’t built in a day…so you should enjoy the journey. I’m Cindy from Little Miss Celebration! 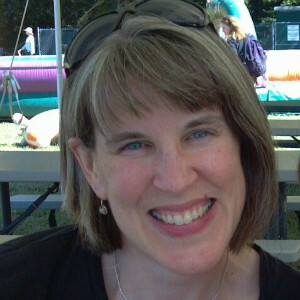 Just like the old Kool and the Gang song (ok, I’m dating myself!) there’s a party going on right here…a celebration to last throughout the year! Whatever YOU are celebrating, we are going to “craft” together all of the things that will kick your special moments into high gear and make every celebration an experience that’s amazing, memorable and awesome! Hi I’m Emily and I blog at Love, Pasta and a Tool Belt. I love to share recipes, DIY projects and talk about my favorite TV Shows. My husband and I recently bought a new to us house and are remodeling it and sharing our adventures as we go. I’m so happy to be here helping Maggie celebrate her blogiversary. 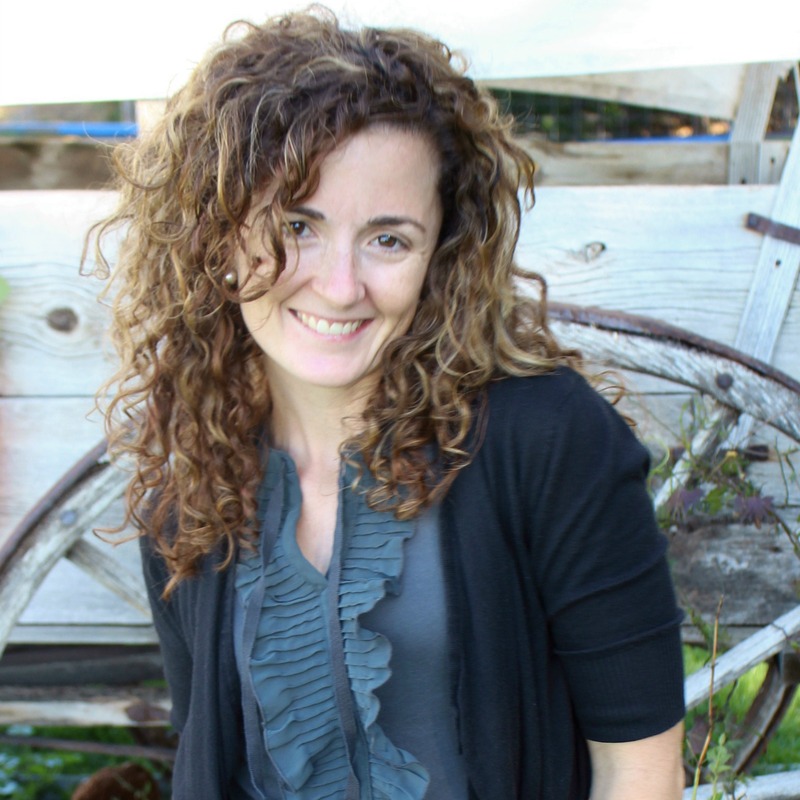 I hope you will stop by the blog and say hello! We have one thing in common, a January 2009 due date, and we’ve been supporting each other and laughing together online for over 5 years now. In January of 2014 we decided to start a blog that showcases our diversity and our commitment to being kind…no mommy or women-shaming with us! Join us for some fun, some informative and some advice…hey, we have 188 kids between us! 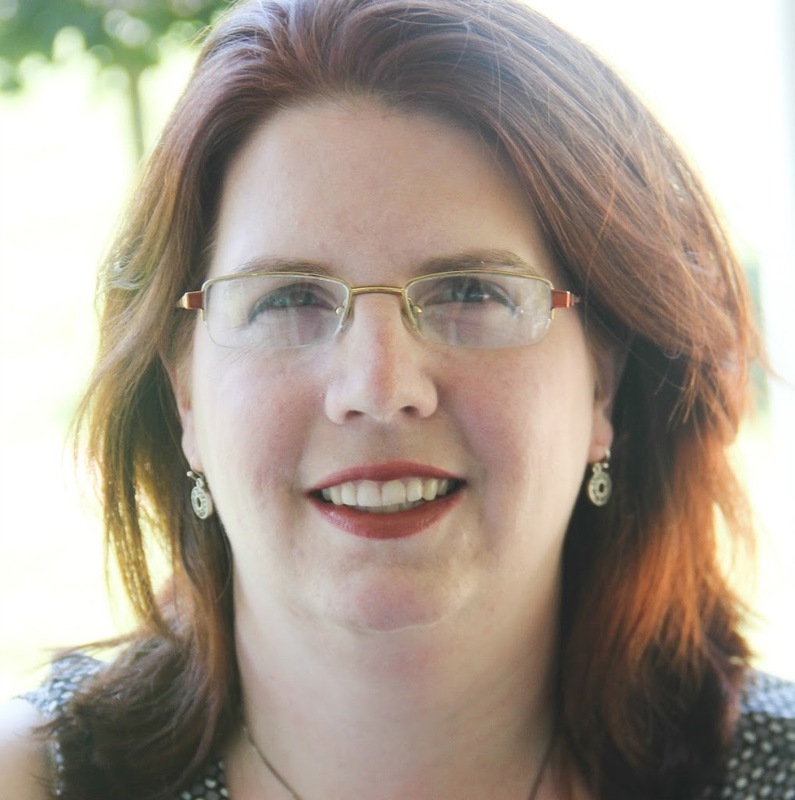 On A Wing And A Prayer is a window into my world where I share everything from crafts to recipes to natural health care solutions and much much more. Promoting the wonderful therapeutic and medicinal uses of doTERRA essential oils is why I became an Independent Product Consultant. There’s an oil for that! 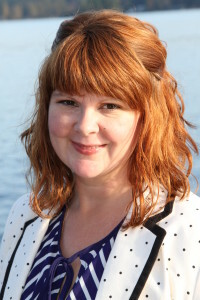 Spindles Designs is our Mother – Daughters blog where we share all of our creative adventures. We love crafts, quilting/sewing, and cooking. Family motto: You don’t have to be crazy to be part of our family but it certainly does help. 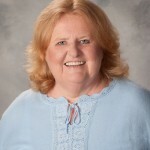 Hi, I’m Mary Ellen! Everyone has something they do well and for me, it’s cooking and baking. Cooking has been a passion for me for many years now and I would like to share my adventure of cooking with you. My hope is that you will find recipes that will be to your liking, recipes that could be served at a family outing, when friends come to visit, holiday time or any time of day. We love the holidays! And we really love making gifts and getting our kids involved is always fun. Our felt Santa is filled with holiday candy. It is the perfect craft for kids to make gifts for friends or teachers. It also works great for decorations around your house. 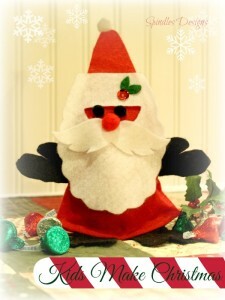 Felt Santa can either be glued together (very kid friendly) or sewn together (for us big kids). This simple pattern will be a great craft for kids of all ages. You can also find us on Facebook, Pinterest, and Twitter.